The total word count on these articles is 3,044 words and includes a bonus set of beautiful quote memes to use in promoting your site and driving traffic to it. 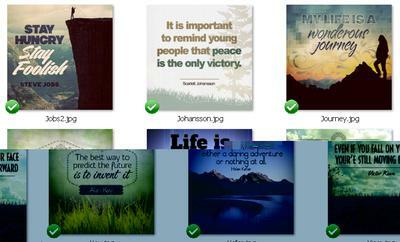 A set of 6 beautiful quote memes to go viral! Procrastination, there's a big ugly word for you. It plagues a large number of people. It's often easier to put something off instead of just doing it. However, the longer you put it off, the longer you have to dread the task when you finally do tackle it. It's wiser to just do the task and get it over with. You know you will feel better about yourself if you do it, but it's not always that simple, is it? Here are some tips to help you bust through procrastination. 1. Decide what's really important to you. Why do you want something done? If it relates to your business, remember why you started your business, your purpose behind it. If it's a personal matter, then decide what the advantages of it are.